The five-member group Alvik is currently one of the most melodic club bands you can hear in Prague. 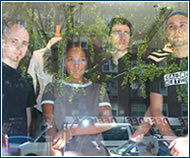 With Anya singing, Radim on flute, Petr on contrabass, Tio on drums, and Mishan designing the program and sound, Alvik gradually refined their music in small venues, jazz clubs, and later in larger halls to reach their current form – a musical style that’s easy to listen to and hard to define. Alvik channels nu-jazz, reflecting the free atmosphere of lounge music, while pulsating to various tempos from abstract hiphop through broken beats to drum’n’bass. This exhibition showcases the creative phases and artistic aspects of the versatile, multi-cultural artist Adolf Hoffmeister – caricaturist, illustrator, original collage designer, writer, poet, dramatist, diplomat, traveler, and art collector. The most noteworthy displays include primitivistic paintings, caricatures, and likenesses of high-profile personalities. Also on exhibit are materials never shown before, such as hundreds of collages from the end of the artist’s life and recently discovered drawings first exhibited during the war in the Museum of Fine Arts in New York, now on display for the first time in Prague. 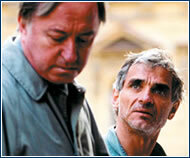 On 6 January, the first Czech feature film of 2005 will premiere. Shark in the Head is directed by Marie Procházková and stars Oldřich Kaiser, one of today’s most controversial actors. The entire film takes place in a small, ground-floor apartment and the street in front of its window. The apartment of the main protagonist, a pathetic loner with a “shark in his head,“ was the ideal set for filming. The film was shot in wide-angle format with three cameras, and features many digital visual effects. A project by the Brno Husa na provázku theater, A Hundred Years of the Cobra, last season’s main event, now continues with a third part. On 12 and 15 January the troupe will present Raskolnikov – His Crime and His Punishment in Prague, on 13 and 18 January Count Myshkin is the Idiot, and on 14 and 17 January Demons – Stavrogin is the Devil. The project’s first three parts deal with men who can’t stand the notion that they’ve fallen short, and with women who try to pacify them and long for children with them. 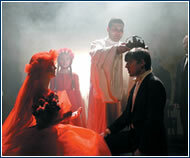 The fourth part, schedule for 2006, is devoted to the Brothers Karamazov and Petr Scherhaufer .